I never had much interest in going to India until today. This morning, a glowing Saturday in Beijing, I treated myself to watching to Ric Burns’ 16 hour long eight-episode New York documentary.� I had gotten up to the final episode, which chronicles the rise and fall of the World Trade Center.� I had seen this episode before, and it’s not the best of the series, so while the steel symbols of a globalized world were rising and falling on one window on my laptop, I was reading the news on another.� News of a city on the other side of the world that I had never been interested in, until a friend shared a story of her parents driving past Cafe Leopold seeing people streaming out, and watching the fire on the rooftop of the Taj as the army rolled in. So will you.� New York is cheering for you. But from where I sit now and where I’ve sat, I see two fundamental reasons for why the financial world has unravelled:� (a) that banks and the financial markets are run by actual human beings, and (b) that Chinese people don’t have the financial protection that would allow them to feel comfortable spending their savings.� If I’m right, this mess may self-correct itself as talented financial managers leave the rubble of New York to help build up China’s consumer financial network — but before we get there, first here’s how we got here. Disclaimer:� I haven’t worked at Lehman Brothers in several years, was never involved in management or oversight, and cannot in any way comment on the financial strength of that company.� In no way, shape or form should this Aabservation be seen as any sort of investment recommendation. At 8:20 am on Tuesday, June 24th, a train pulled out of Penn Station in New York heading north at 35 mph on an eleven hour journey through cornfields, cows and rainbows to Montreal.� On this train, my sister, 14 bags of her stuff, and me, completed the next stage in a story of immigration that, as family lore would have it, includes Genghis Khan, a potato famine in Ireland, fleeing from Odessa to Athens with only a baby carriage after overhearing some revolutionary sailors in a park, friendly USSR-Cuba relations, a cheap-season trip to Club Med and a fateful sunburn, and British poetry.� But this newest leg in the story of how my sister ended up migrating to francophone Canada was driven by a much better reason than some of the wars and famines that have moved the Aabs and Hawrylkos in the past:� some Canadian guy named Marc, who, after June 28th, I have been happy to call my brother-in-law, and whom my sister is happy to call her Happily Ever After. But even with rainbows and misty gondola rides through mountains glimmering with fireflies and the Power of Love (yes, my sister’s wedding was indeed amazing), migrating ain’t easy.� It’s not easy for those who go, schlepping their strange accents and rice bags of shoes to countries that count kilometers instead of miles.� It’s not easy for those they leave behind, who wonder how long they have to store their high school textbooks.� And it’s not easy for those who were already there, who somehow have to make room in their closets and cities and subways for these strange new newcomers. Because it isn’t easy, there has to be something really darn good about the place people migrate to, in order to make it worth all that disruption.� (And not every place is lucky enough to have a Marc. )� So come be awed with me for a moment at the march of the humans, more powerful and romantic than Morgan Freeman’s penguins ever could be.� Be awed with me at the ability and willingness of a population to get up and leave home to pursue a better life — a hallmark of significant societies throughout history. And the places these people go:� they have become the greatest civilizations of our time.� If you want to understand where the world is going next, look where its people are going. Perhaps it’s just because I’ve been living in China for so long that I’m intrigued by the ideas of a safe protest for freedom of expression and the press, a petition I can’t get in trouble for signing, and a public gathering to voice an opinion. 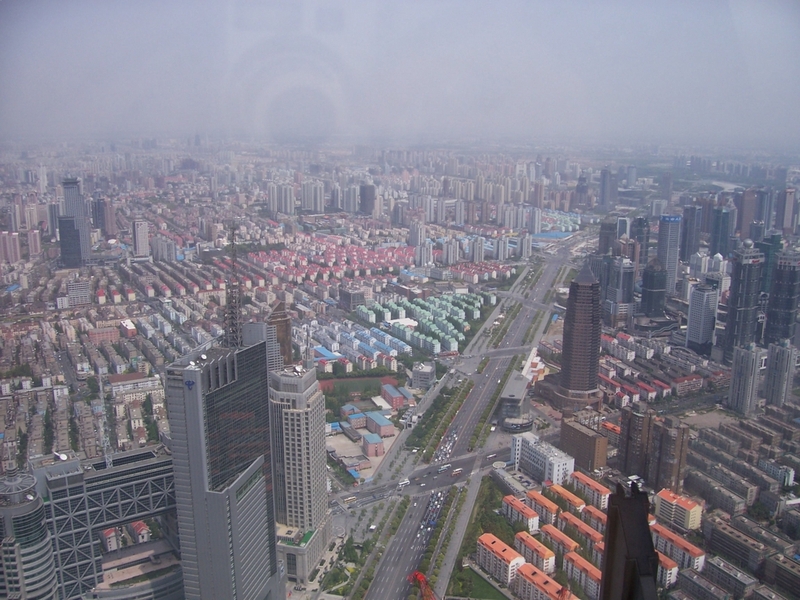 Shanghai suburbanization photo�by�Elizabeth Aab is licensed under a Creative Commons Attribution-NonCommercial-Share Alike 3.0 License. .
– William Whyte, The Exploding Metropolis, 1958.� Talking about New York. This quote was in an exhibit I saw when I was in NY at Columbia University on Robert Moses, the (in)famous developer of New York during the mid 20th century. But it could just have well been used to describe Beijing (or Chengdu, Shanghai, Kunming, Xi’an, Chongqing, Qingdao or any major Chinese city) today. The rents for one-bedroom apartments in Manhattan average $2,567 a month, and two-bedrooms average $3,854 a month, according to data from Citi Habitats, a large rental brokerage company, but rents tend to be far higher in coveted neighborhoods like the Upper West Side and TriBeCa. Because landlords typically require renters to earn 40 times their monthly rent in annual income, renters of those average apartments would need to earn at least $102,680, individually or combined, to qualify for a one-bedroom and $154,160 to afford a two-bedroom.